Janssen has always been frugal. Saving the little money I made didn't make sense to me (pun not intended), since I'd soon be making the big bucks, at which point an extra five or ten thousand dollars in the bank would be small change. In other words, I didn't want to make a relatively big sacrifice when I was young only to reap a relatively small reward when I was older. While I still think that philosophy is debatable, depending on what kinds of sacrifices are being made and what kinds of rewards are being reaped, something that is not debatable is the fact that Janssen had a profound effect on my frugality. Reflecting back, I have identified 5 pivotal experiences that resulted in my full conversion to a life of frugal living. The first was when Janssen and I were just days away from getting married, and Janssen paid off my car with a good chunk of her savings - savings she had been working on since she was a little girl. Oh how I cringe at the thought. She had made the sacrifice I had been unwilling to make, and her hard-earned money represented years of work, from selling muffins with her sisters to people in local office buildings, to spending long hours at Cold Stone as a busy high schooler with plenty of other pastimes she might have enjoyed instead. And there I was - a 25 year-old guy with no savings to show for years of working part-time through high school and college. No, I couldn't be bothered to save for the future. It was too much of a sacrifice. All the sudden that philosophy sounded pretty lame. And the embarrassment and inspiration I felt as my amazing fiancée wrote that check marked the beginning of my conversion to frugality. Step #1: Be an example. I understand a little where you're coming from, Bart. I have always saved... a little bit, but not as much as I could. When I finally got myself through school and had a real job (although the pay wasn't big... teaching), I saved about $75 a month and spent the rest on books, strawberries, and other such splurges. When we got engaged and I started really saving, it was embarrassing that I could save in two months what I had previously set aside in nine. 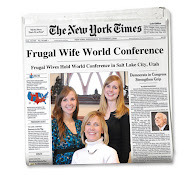 My husband is a much better saver than I am, which I am profoundly grateful for! Hooray for frugal spouses. Amen-brother! I am right now trying to do that.....both David and I have always been big spenders....now I'm a cheapskate...ooopps....I mean "frugal" :) - and I'm trying to lead by example (he's not jumping on the wagon as quick as I would like)....work in progress!